History: The history of Bebek Marzipan actually dates back to 1904, more than a century ago and this is only the registered date on offical records. The shop was first founded in Mudanya by the grandfather of Sevim İşgüder who still runs the shop today. The exact date of the original shop’s foundation is unknown because of an unfortunate fire that destroyed it. When Mehmet Halil İşgüder, the father of Sevim İşgüder, first came to Istanbul to study in high school, he met Anastasia. Anastasia was an Istanbul Greek and they fell in love with each other. Though the families objected to the relationship between them at first, they had to accept the situation eventually. After their marriage, grandfather Mehmet Halil Bey rented a shack in Bebek to use as a shop. It was on the plot where the ferry port stands now. They worked there together, father and son, and created delicious hard candies, marzipan, macaroons and buzlama. When Mehmet Ali Bey died, his daughters Sema and Sevim were 14 and one and a half years old respectively, and Anastasia took over the family business. She started selling her sponge cakes to the famous Cumhuriyet, Kamelya and Boğaziçi patisseries of the time. Sema and Sevim, the two little girls, helped their mother by shelling almonds together with the other children in the neighborhood. The child who shelled more almonds than any of the others got a surprise present. The almonds then were dried on stoves and grills and this way “Madam’s marzipan” started to rapidly gain in popularity. Sevim İşgüder, who was reluctant to get involved in the family business and used to say “Even if I can’t find a job, I will do other people’s laundry or clean their houses instead of doing this!” found herself in the shop after her mother’s health deteriorated in 1957, and she had to give up her hopes of becoming an artist. Still, from then on she had a circle of friends most of whom were artists and writers. Sema and Sevim spent long years in the business, one stayed in charge of manufacture and production and the other one preside over the cash register. 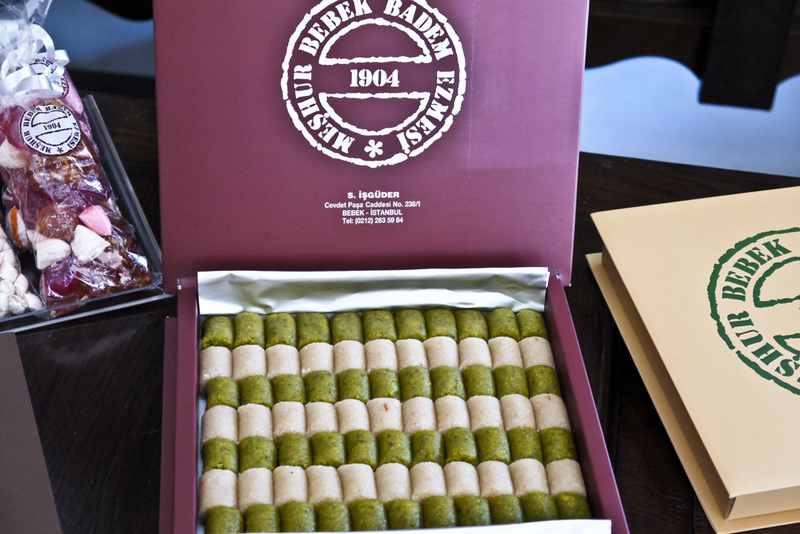 The reason Bebek Marzipan has maintained its popularity for more than a century is quite simply that the ingredients are carefully selected and the products are prepared with the utmost care and love. The quality of almonds is of greatest importance in the hand-made and natural process in which no additives are used and machines only intervene to crack the hard shells of the almonds. Bebek Badem Ezmesi uses almonds from regions such as Diyarbakır, Mardin, Midyat and Elazığ that are rich in essential oil.